This week, I did something I haven't done for a while - I attended a double bill at the cinema. Of course, I've had plenty of days over the past year where I've watched two films back to back at home, but there's something different and a bit special about sitting in the dark at the movies at the same seat for four hours or so. I occasionally see adverts for 'film marathons' (last year, there was a event held in Brighton, showing John Carpenter films all night, which sounded amazing); I'll have to keep my eyes peeled and see if anything similar is coming to Bristol in the near future. I'm generally a big fan of Judd Apatow produced comedies, though I have to admit that his films diverge wildly in quality. I'd put films like Superbad, The Forty Year Old Virgin and Knocked Up owards the top end of the scale, with others like Talladega Nights, Funny People and Pineapple Express on the lower end. Looking at the above movies, the pattern seems to be that where Apatow is directing the film himself, it's likely to be good - otherwise, you're on much shakier ground. I'm a little less convinced about the merits of Will Ferrell - I think the guy can be very funny (particularly in Anchorman) but all too often (as is the case with this movie) he turns in a lazy variation on his favourite 'manchild' character, with a few inspired gags buried in an avalanche of bits that just don't work, and which go on for far too long. This is kind of a shame, as the premise of the film - two lazy, middle aged stay-at-home kids (Ferrell and John C. Reilly) who are forced to grow up when their parents get married - certainly could have been made into something much stronger. The movie has one or two really funny moments, but for every good joke, there are about five that just don't work. Even then, I wouldn't have minded too much, but I just felt that almost every character in the film was unpleasant. I guess we're supposed to root for Ferrell and Reilly's characters, but they're both too odious to care about. 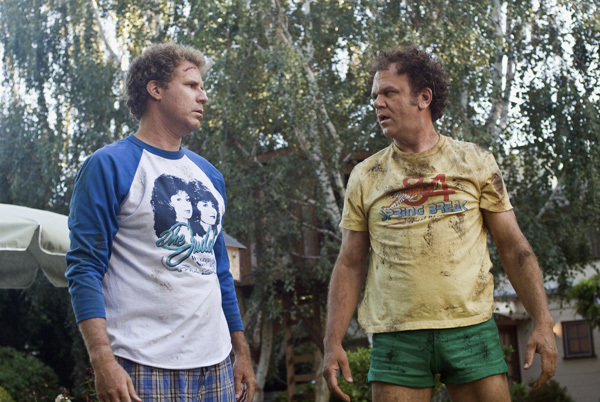 I'm afraid to say that Step Brothers feels more like a generic, weak Will Ferrell movie than something which Judd Apatow has had much of a hand in. Sometimes when you come back to a film you loved as a child, it's just as good as you remember it, and you can enjoy the film as more than just nostalgia. (A couple of examples of this would be E.T. and Big, which I can pretty much watch again and again). Other times, when you revisit an old favourite, you find yourself wondering what you found to be so magical about that movie in the first place. 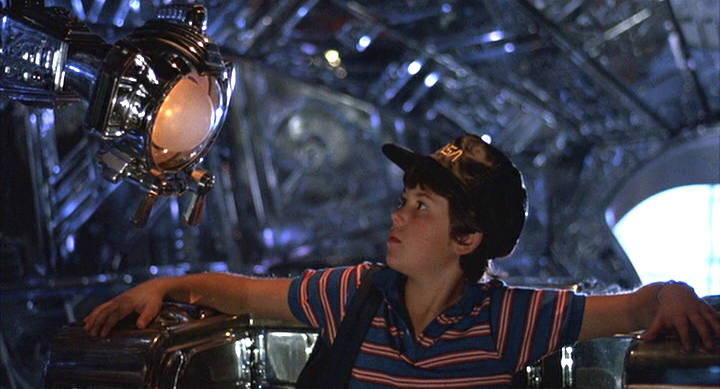 For me, Flight of the Navigator fits squarely into that second category. The premise is still pretty interesting; our hero, David Freeman (aged 12), goes out into the woods to fetch his brother, falls down a ravine and blacks out. When he comes to his senses, he is astonished to discover that eight years have passed, and while his parents and younger brother have grown older, he hasn't aged a day. (This is kind of the opposite of the phenomenon that Wooderson observes in Dazed and Confused). He's subjected to tests by NASA, who discover that he appears to have been implanted with information from a recently discovered UFO. David isn't too keen on being treated like a human guinea pig, however, and takes to the skies in the alien vessel, with the authorities in hot pursuit... I wouldn't say that I hated this movie this time around - as I've mentioned, the plot is intriguing and the picture's short running time meant I never had the chance to get bored with the proceedings. 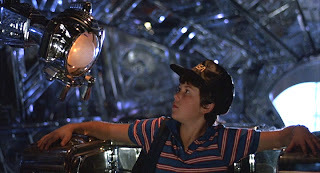 Unfortunately, there are certain aspects of the film (which I probably loved as a kid) which I now find really grating; particularly the voice of the computer controlling the space ship, which is supposed to be 'wacky' and 'fun', but is just really irritating. All the same, I'm going to be fairly generous with the mark I give this film - I probably would have given it a '10' when I first saw it, and I reckon it would still be entertaining for a younger audience today. This recent Aussie crime drama (and the first part of my Thursday night double bill) can be filed alongside Lilya 4 Ever, We Need To Talk About Kevin and The White Ribbon as 'films which I really liked which are too traumatising to watch again'. (There's a great list of similar movies on the AV Club website, here: http://www.avclub.com/articles/not-again-24-great-films-too-painful-to-watch-twic,2048//). The setting is Adelaide in the '90s, in that city's deprived northern suburbs, where Jamie Vlassakis (Lucas Pittaway) is growing up with his mother and three brothers. Into this poverty stricken environment comes John Bunting (Daniel Henshall), who with his easy smile and breezy self confidence at first appears that he will be a positive influence on Jamie's life. However, his cheery, laddish exterior is a mask for the evil within, and as a father figure, he inducts Jamie into his circle of murderers. They start by targetting suspected paedophiles in their community, before moving on to attack anybody who is vulnerable and wouldn't be missed. 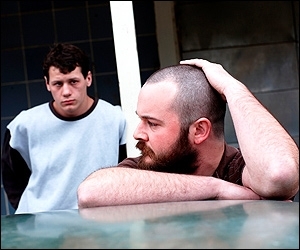 As a dramatisation of the events surrounding a notorious serial killer, I kind of expected Snowtown to be graphically gruesome, but in terms of on screen atrocities, with one notable exception, the film is quite restrained. That's not to say it pulls any punches in relation to spelling out just how horrifying the actions of Bunting and company were - it's just that for the most part, the brutal extent of the killings is left to the viewer's imagination. Nevertheless, by the end of the film, you feel rather like Lucas Pittaway's central character - numb and speechless from the horror you have witnessed. Kenneth Lonergan's brilliant debut picture, You Can Count On Me, is one of my favourite films, so I was intrigued to see how this follow up would fare in comparison. To be honest, I wasn't overly optimistic going in, as I had heard that this film had been the subject of a protracted legal battle over the content of the final cut, and that the version of the film on release was shorter than Lonergan had originally intended. Anyway, after seeing the film, I can say that it exceeded my expectations to a large degree. This was the second part of my Thursday night double bill, and after subjecting myself to the horrors of Snowtown, I suppose it came as a sweet relief to spend some time with characters who weren't likely to find themselves at the wrong end of John Bunting's big bag o' torture implements. It's a little hard to summarise what Margaret is all about, other than to say that it is a drama set in New York shortly after September the 11th, with are a wide variety of subplots and interesting supporting characters. However, the central plot focusses on the consequences of a tragic bus accident, in which a pedestrian (played by Alison Janney) is run over and killed. 17 year old Lisa Cohen (Anna Paquin), who was distracting the driver at the time, feels guilty over her role in the tragedy, and decides to encourage the victim's family to sue the bus company. Paquin delivers a fantastic lead performance, and is unafraid to show the negative side of her fully realised character - somebody who is intelligent and articulate, but who can be narcisstic, self righteous and cruel. Although at times the editing of the film is a little confusing, with some scenes ending rather abruptly, the film more than makes up for it in other areas. There are a number of scenes which are quite brilliant - I particularly enjoyed the awkward dinners between Lisa's actress mother (J. Smith-Cameron and her rich suitor (Jean Reno), the scene where Lisa loses her virginity to the impossibly laid back Paul (Kieran Culkin) and the often hilarous interactions at Lisa's Upper West Side school, with Matthew Broderick and Matt Damon appearing as teachers. (Broderick's role is rather similar to the one he memorably played in Alexander Payne's Election). Although Margaret may not be perfect, it's got some of the best acting and sharpest dialogue I've seen in a film for quite some time. I'm just looking forward to the time when Lonergan is able to deliver his own, definitive cut of the film. In which Andy Samberg and his Lonely Island pals (Jorma Taccone and Akiva Schaffer) take their Youtube-approved schtick into the exciting world of daredevilling (or daredevilmanship - I'm not quite sure what the correct term is here). 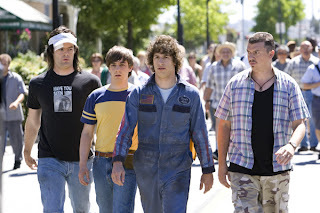 Samberg plays Rod Kimble, a guy in his 20s with aspirations to be the new Evel Knievel, and whose other quest in life is a strong desire to beat his disapproving stepfather (Ian McShane) in a fight. When he discovers that his stepfather has a serious heart condition, and that as a result, it will no longer be possible to defeat him in combat, Kimble decides to raise money for the heart surgery by jumping over 15 school buses. Unfortunately, 'Hot Rod' is possibly the worst stuntman in the world, unable to jump over even a small swimming pool. In a way, this movie seems a little like Step Brothers - the protagonists are all guys in their late 20s and early 30s, who still act as if they are kids. In contrast to Step Brothers, though, there's a certain sweetness and naivety about these characters which makes you root for them. Of course, the most important question here is whether the movie is funny or not - and I'd say that most of the time, it is. (As a rule of thumb, any scene involving Will Arnett is comedy gold). Samberg and Taccone are helped out by a strong ensemble cast of comic actors who have cut their teeth on American comedy shows like Saturday Night Live, Arrested Development and Eastbound and Down, such as Bill Hader and Danny McBride. All in all, it's no masterpiece, but if you like mopeds, partying and damp fireworks, you're in for a treat. Although I've seen all of the recent Bond movies (which have ranged from very good - Goldeneye and Casino Royale, to downright atrocious - Die Another Day), I wouldn't describe myself as a huge Bond fan. When it comes to the older films, I'm sure I've seen most of them at some point or other on ITV on rainy afternoons, but they all seem to blend into one another. I therefore wasn't completely sure whether or not I'd actually seen the film before. Anyway, having now watched this one, I'm pretty sure it isn't a Bond movie I've seen before. This is only the second instalment in the Bond series, and sees the British and Russian governments played off against one another by supervillain Blofeld and his organisation, SPECTRE. When From Russia With Love was made, way back in the '60s, James Bond was a fairly regular secret agent (and part time lothario) - he didn't have the superpowers in bullet dodging, martial arts and product placement which he gains in more recent instalments. This is probably stating the obvious, Sean Connery makes for an excellent Bond - he's tough, with a kind of rumpled cool. 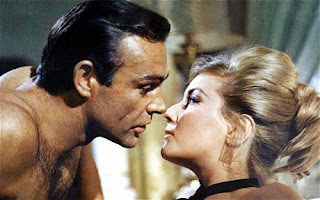 Although the action sequences look a little tame in comparison with more recent entries in the series, the movie is well plotted, features a memorable Bond girl in Daniela Bianchi, and makes good use of footage shot on location in Istanbul. This movie seems to be the frontrunner for Best Picture Oscar this year, and has already snagged a few Golden Globes (as well as an overwhelming number of rapturous reviews from leading critics), so I decided to check it out and see what the fuss was all about. Of course, the film's big gimmick is that as well as being set in 1920s Los Angeles, and concerning the life and times of a silent film star, the movie itself is largely silent, with dialogue provided by means of title cards. Despite this, the plot is fairly straightforward, and easy enough to follow without any need for speech, even for an ignoramus such as myself. 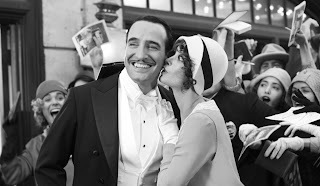 Jean Dujardin plays 'The Artist' in question, an actor called George Valentin, who begins the film on top of the world, living the life of a Hollywood success story - with a a luxuriously appointed mansion, chauffeur driven car and thousands of screaming fans. Sadly for George, his era is about to come to an end, with the advent of the 'talkies'. While his star is on the wane, Peppy Miller (Berenice Bejo)'s career in in the ascendancy. When George loses everything but his dog, only Peppy can reinstate him to a position of prominence in Tinseltown... I'm going to have to come out and admit my complete ignorance when it comes to silent movies - I've never seen one in full before - so I guess quite a few of the nods and winks which The Artist gives to classics of that era went completely over my head. Despite that, I did really enjoy the film. I didn't find it to be quite as brilliant as certain critics have made out, but despite a few rather dull stretches in the movie, it was funny, touching and beautifully shot. The two lead actors both give terrific, highly expressive performances, which are all the more impressive for the fact that barely a word is uttered by either for the duration of the film. Judging by the Golden Globes, the other major contender for Oscar success is The Descendants (starring George Clooney). I believe that movie is out over here towards the end of this month, so I'll have to compare it with The Artist and see which of the two I prefer. I'm sure the Oscar judging panel will be waiting with baited breath for my opinion on the matter.